Reader - 2 Posts - Basic Pay 5200 Grade Pay 2400 in Pay Band I category - 10th Std Pass. Examiner - 1 Post - Basic Pay 5200 Grade Pay 2400 in Pay Band I category - 10th Std Pass. Senior Bailiff - 2 Posts - Basic Pay 5200 Grade Pay 2400 in Pay Band I category - 10th Std Pass. Junior Bailiff - 7 Posts - Basic Pay 5200 Grade Pay 2200 in Pay Band I category - 10th Std Pass. Shroff - 1 Post - Basic Pay 5200 Grade Pay 1800 in Pay Band I category - 10th Std Pass. Assistant Shroff - 1 Post - Basic Pay 5200 Grade Pay 1650 in Pay Band I category - 10th Std Pass. Machine Operator (Xerox Machine Operator) - 1 Post - Basic Pay 5200 Grade Pay 1650 in Pay Band I category - 10th Std Pass with 6 months experience in photo copying service. Court Keeper - 2 Posts - Basic Pay 4800 Grade Pay 1400 in Pay Band I-A category - 10th Std Pass. Office Assistant - 19 Posts - Basic Pay 4800 Grade Pay 1300 in Pay Band I-A category - 8th Std Pass. Masalchi - 1 Post - Basic Pay 4800 Grade Pay 1300 in Pay Band I-A category - Read and Write in Tamil. 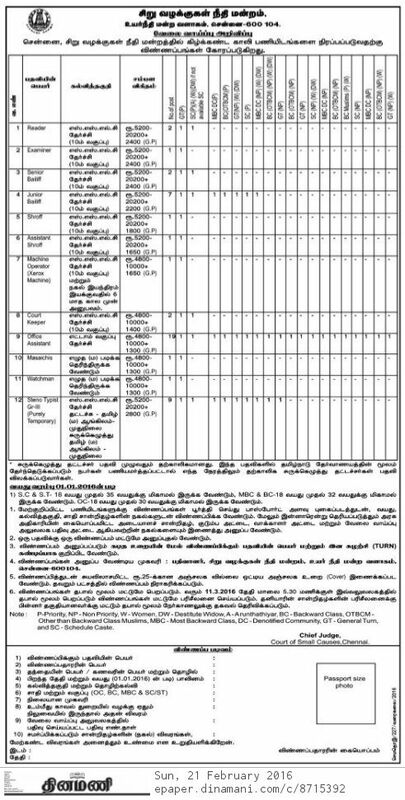 Watchman - 1 Post - Basic Pay 4800 Grade Pay 1300 in Pay Band I-A category - Read and Write in Tamil. on or before 11th March, 2016.